Product information page of Vertical scroll shoot'em up "BLUE SABERS Early Mission". 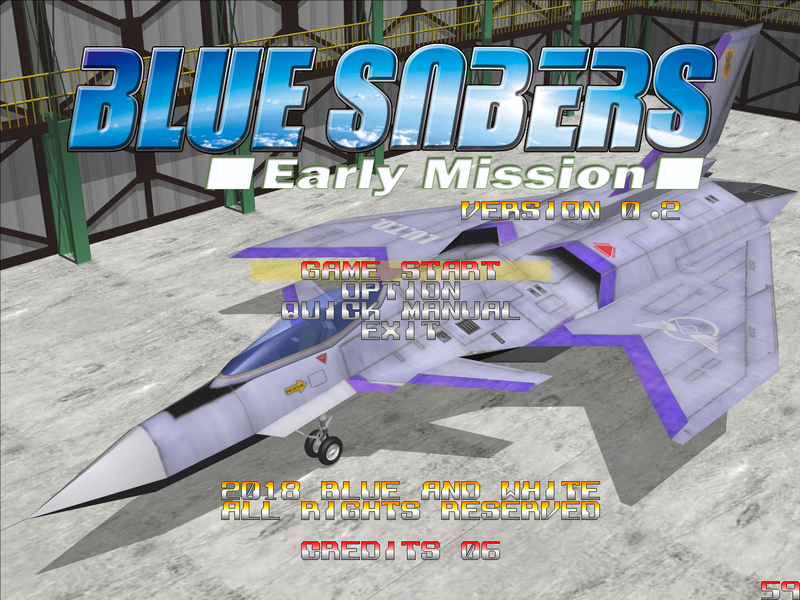 Free trial version of "BLUE SABERS Early Mission". Unlike product version, stage, difficulty, aircraft selection, etc. can not be done. Shotguns and special weapons equipped by the player’s aircraft are used freely to defeat enemies, and the stage is cleared when the boss in that stage is defeated. The player’s aircraft loses one shield if hit. If the player loses all shields, the player’s aircraft is destroyed, and it’s game over. Wield 3 types of special weapons any time, as long as you have ammo, and prevail in difficult situations. There are no power-up items, so you can be free to come up with tactics without having to worry about when and how items will appear. Fight along with the trusty ally craft "GARUDA"
You can call on the ally craft "GARUDA"(Gunship And Reload Unit Directly Airsupport) at any time. When it appears, it will fight in combination with you, so you can replenish special weapons and restore your aircraft’s shields. When GARUDA appears, your aircraft is not an enemy target, and GARUDA is aimed at instead. Finally, GARUDA has shields separate from your aircraft’s; GARUDA is destroyed when those shields reach 0, and you will become unable to replenish your resources. GARUDA’s shields are gradually restored when the craft has not been called on to help. You get maximum points in this game by figuring out how to move forward while skillfully calculating the timing of resource replenishment and forging a path to survival with powerful weapons. Rank is assigned after careful examination of play when a stage is finished, and various additional items will be granted accordingly. The strange quietness called "Phony War" came between the military company union MUCOC (MUltinational COmpanys Community) and IUTO (International Unification Treaty Organization). Because MUCOC lost the Roysenstahl which was the most major company in the ground by attack of aeronautic mobile troops including the 99th tactical fighter wing "BLUE KNIGHTS" of the Joint Air Force, the ground power of MUCOC grew rapidly smaller, and these caused the sporadic battle. IUTO didn't recover the military power from big damage at the beginning of war and a lot loss at the "Operation Windstorm". So, it was difficult that IUTO would also continue the more mission, and these led definitive cease-fire agreement to conclude soon. On one hand some of signatories to IUTO were worried about a great loss and suggested an appeasement against MUCOC; on the other hand, some power wanted to extend the military power under color of the settlement of this situation and the reinforcement of deterrent power by the force . Time passed without getting together this measure. But, it was clear that this quietness is temporary. Astraltech which is the major orbital company union and a basic company of MUCOC that has a stronghold on orbit succeeded in affiliating the subcontract company of Roysenstahl by confusion of company's collapse. It became in an impregnable position in MUCOC, and it purchased derelict resource minor planets LP-2(*1). The function of the head office moved, and it was going forward with the retrieval of fortress facility. And then, it assimilated talents and the development technology of mobile weapons of old Roysenstahl with all its force, and it had a great orbital fleet by applying this technology to space development field. Now, "MUCOC War" took a new turn. The driving earth troops take off from MUCOC fleet on the orbit. Later, it was the beginning of war called "The Second MUCOC War". But, the Joint Air Force was different from last war that suffered heavy damage by surprise attack. They developed an effective intercept operation. Though they didn't bring stopping the descent mission, they succeeded in minimum establishment of a bridgehead in the ground. On the other hand, by a delay in development technology at the big mobile weapons and the space field, they was lacking in a decisive blow to the MUCOC orbital company troops. Because the requisitioned facility of MUCOC Roysenstahl was almost destroyed when withdrawing, an analysis of this technology was very difficult. Saphaial Aerospace which cooperated with IUTO side in these succeeded in analysis and diversion of this technology. They went forward with this delivery to the Joint Air Force and the development of a new plane which had an space battle ability with "BETA", "GAMMA", and "EPSILON" series that was the conventional main power. However, the operations of the "BLUE KNIGHTS" the elite forces who should have had priority in the deployment of these new aircraft?were tight, and everything possible was being done to maintain the front, so it happened that model-changeover drills for the pilots didn’t go as planned. For that reason, pilots from units that were on break or being reshuffled were drafted from the whole army, and selection of troops for the establishment of a unit to become the new, main one moved forward by means of field training that included the model changeover and by VR simulation. The name of the newly organized unit was the 8th Tactical Fighter Squadron "BLUE SABERS".